One outstanding lens; endless beautiful memories. The world is full of amazing views—some right in front of us, others far in the distance. Capture all of them beautifully with a single lens, the outstanding all-in-one telephoto zoom AF-S DX NIKKOR 18-300mm f/3.5-6.3G ED VR. Surprisingly compact and lightweight for a 16.7x zoom lens, the AF-S DX NIKKOR 18-300mm f/3.5-6.3G ED VR draws great performance from Nikon DX-format D-SLRs and is a highly versatile second lens. Shoot wide-angle scenic landscapes and group photos, portraits with softly blurred backgrounds, super-telephoto close-ups and everything in between—if you can see it, the AF-S DX NIKKOR 18-300mm f/3.5-6.3G ED VR can capture it. Optimized for shooting both stills and HD videos, it features specialized Vibration Reduction technology for tack-sharp photos and steady videos, even when your hands are a bit shaky. And since it's a NIKKOR, it features some of the best optics available. Whether you're looking for maximum versatility in a lens or you're just the kind of photographer who finds inspiration all around, the AF-S DX NIKKOR 18-300mm f/3.5-6.3G ED VR will help you capture more of life's great views. 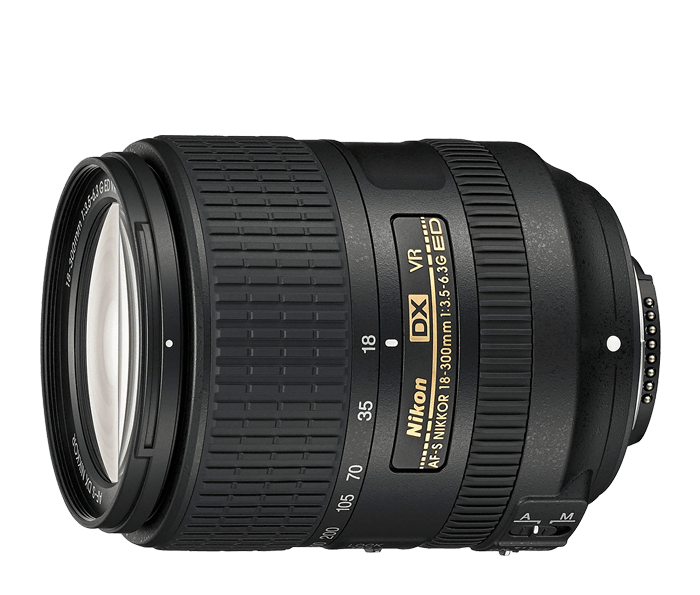 The AF-S DX NIKKOR 18-300mm f/3.5-6.3G ED VR can do just about anything—stills, videos, landscapes, interiors, portraits, wildlife...you name it. Its massive zoom range goes from wide-angle (27mm equivalent in 35mm) all the way to super-telephoto (450mm equivalent in 35mm), so you can catch stunning close-ups of concert performers and athletes as easily as wide scenic shots. Its compact, balanced design and Vibration Reduction technology help keep photos sharp and videos steady, and the lens' fast, quiet autofocus system minimizes camera noise during video recording. A little camera shake can ruin an otherwise great photos or video, especially when shooting at super-telephoto distances. To combat camera shake, the AF-S DX NIKKOR 18-300mm f/3.5-6.3G ED VR features Nikon's Vibration Reduction technology, which provides 4.0 stops* of blur-free handheld shooting. Capture crisp, clear photos and steady videos even if your hands are a bit unsteady. Additionally, VR is a big advantage in low-light situations—slow down your shutter speed without compromising sharpness. Like all renowned NIKKOR lenses, the AF-S DX NIKKOR 18-300mm f/3.5-6.3G ED VR delivers stunning image quality—vibrant color, sharp detail, and minimal distortion. To enhance that superb optical performance and increase its versatility as both a photo and video lens, the AF-S DX NIKKOR 18-300mm f/3.5-6.3G ED VR includes Nikon's advanced lens technologies like Silent Wave Motor (SWM) for ultra-fast, near-silent autofocusing, three Aspherical (AS) and Extra-low Dispersion (ED) glass elements for maximum contrast and minimal lens flare and ghosting, a rounded 7-blade diaphragm for beautiful, natural background blur and Internal Focusing (IF) for a more compact, streamlined lens design.